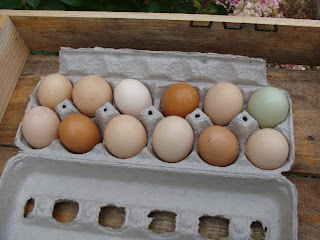 Some of you may be wondering if we will have eggs for sale again, and we are so pleased that the answer is yes! A couple weekends ago we received an order of lovely hens from the awesome Dare 2 Dream Farm in Lompoc. They loaded these ladies up and delivered them right to our door. They are between 10 and 14 weeks old now and we expect them to start laying sometime in the next couple months. 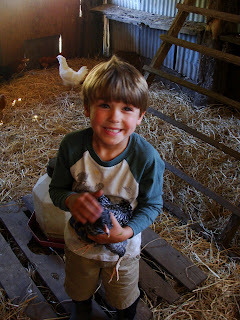 After being used to farm fresh eggs from pastured chickens it is hard to eat anything else. And we have been told countless times that the eggs from our hens are the very best. We agree! And are glad that we will have eggs to offer to our members and customers this fall. The demand is so high that we hope to make another order for more hens later this summer. Thanks to all of you and your participation in our program we are able to continue to invest in our farm for the benefit of our entire community! This recipe is for 1 quart of pickles. It is really easy to multiply it to make multiple quart jars. The amount of cucumbers depends on the size - around 8-10 medium sized for 1 quart, more if they are smaller, fewer if they are bigger. 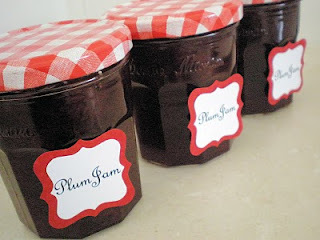 If you want to make more in a larger crock or jar but are not sure how to adjust the recipe just measure how much water the container holds. This will determine how much brine to make, which gives you an idea of how many cucumbers you will need. • 8-10 medium sized pickling cucumbers, washed and lightly scrubbed to remove spines. 1. In bottom of jar, place 2 cloves of garlic, 1 onion slice, 1 dill flower, 1 grape leaf and 1/2 of the hot pepper if desired. 2. Fill jar with cucumbers, standing them up to get as many in the jar as possible. 3. Then add another 2 cloves garlic, 1 onion slice, 1 dill flower, 1 grape leaf and the other 1/2 of the hot pepper on top. Sprinkle the pickling spices over everything. 4. To make brine, bring 1 quart water, the rock salt and vinegar to a boil. 5. Pour brine into jar over cucumbers. 6. Cover loosely and let sit on your counter or in your pantry for 10 days to 2 weeks. Occasionally check pickles and push back into brine. When pickled to your liking (they will get more sour and less salty over time) Cover tightly and put into fridge. Good for up to 2 months. An almost unbelievably sweet and wonderful side dish. The sugar in the beets caramelizes, and the flavors of the rosemary, beets, and butter meld beautifully. 1. 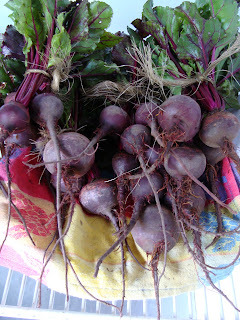 Trim the beets and peel them as you would potatoes; grate them in a food processor or by hand. Begin preheating a medium to large non-stick skillet over medium heat. 2. Toss the grated beets in a bowl with the rosemary and salt, then add about half the flour; toss well, add the rest of the flour, then toss again. 3. Place the butter in the skillet and heat until it begins to turn nut-brown. Scrape the beet mixture into the skillet, shape it into a nice flat pancake-like circle, and press it down with a spatula. Turn the heat to medium-high and cook, shaking the pan occasionally, until the bottom of the beet cake is nicely crisp, 6 to 8 minutes. Slide the cake out onto a plate, top with another plate, invert the two plates, and slide the cake back into the pan (I just used a big spatula and flipped it). Continue to cook, adjusting the heat if necessary, until the second side is browned. Cut into wedges and serve immediately. This salad was really easy and so fresh and tasty. We really enjoyed it. 1. In a medium pot of boiling salted water, cook orzo until al dente, according to package instructions. Drain well. Rinse with cold water to cool completely. Put into large bowl and drizzle with about a teaspoon olive oil, mix to coat. 2. In a large skillet, heat 1 tablespoon oil over medium. Add zucchini and garlic; season with salt and pepper. Cook, tossing occasionally, until tender, 4 to 6 minutes. 3. 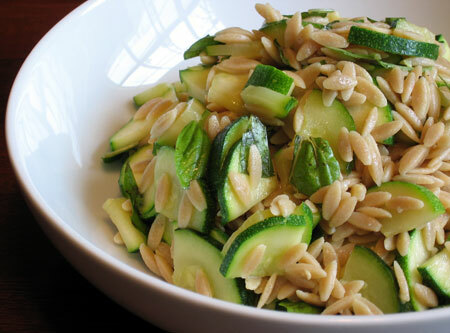 Add zucchini mixture, basil, vinegar, and remaining teaspoon oil to bowl of orzo. Season with salt and pepper if needed; toss to combine. Cucumbers are here! These lovely little cukes are great for eating fresh and perfect to pickle. Full of vitamins, minerals and folic acid, cucumbers are much healthier than most people realize. This is the time of year to enjoy a refreshing cucumber salad or take an afternoon to put up some pickles. If you are a little intimidated by the idea of canning but still want to enjoy the taste of homemade pickles I have the perfect recipe for you. These "countertop" pickles can be made in a large crock or jar and then are left to pickle on the counter top before putting in the refrigerator to enjoy over the next couple months (if they last that long!) Foolproof and safe, quick easy and so tasty! Let us know if you are interested in buying some for your project, or come on by the farm stand to pick up a basket! This recipe is for 1 quart of pickles. It is really easy to multiply it to make more. 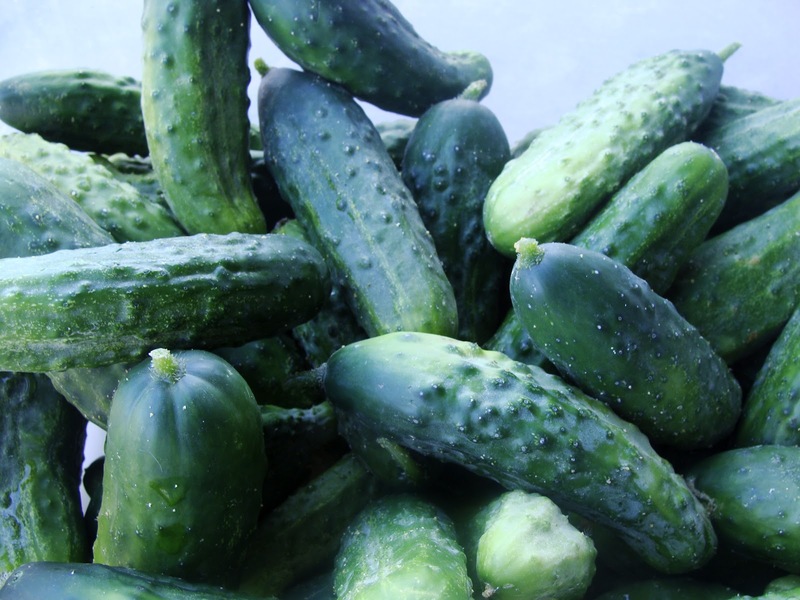 The amount of cucumbers depends on the size - around 8-10 medium sized for 1 quart, more if they are smaller, fewer if they are bigger. If you want to make more in a larger crock or jar but are not sure how to adjust the recipe just measure how much water the container holds. This will determine how much brine to make, which gives you an idea of how many cucumbers you will need. 1. In bottom of jar, place 2-3 cloves of garlic, 1 onion slice, 1 dill flower, 1 grape leaf and 1/2 of the hot pepper if desired. 3. Then add another 2-3 cloves garlic, 1 onion slice, 1 dill flower, 1 grape leaf and the other 1/2 of the hot pepper on top. Sprinkle the pickling spices over everything. 6. Cover loosely and let sit on your counter or in your pantry for 10 days to 2 weeks. Occasionally check pickles and push back into brine. When pickled to your liking (more sour and less salty) Cover tightly and put into fridge. Good for up to 2 months. Hello members, and welcome! Thank you all for joining us - again- or for the first time. The weather has been pretty near perfect, plants are strong, fruit crops look good and we are ready for a fantastic harvest! 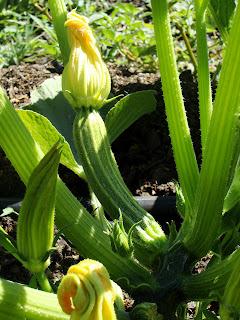 It is hard to believe that we are just getting CSA started and July is already halfway over. Every summer I tend to look back on our farm’s achievements of times past. This previous year was full of big changes for us, on the farm as well as personally. We wrapped up last season feeling that despite the horrible weather it was overall a pretty good year. Thanks to a strong team that really supported us while we were so busy building our house we had an awesome early CSA start, a diverse harvest with some new crops and great success with our apple pressing and hard cider classes last autumn. This winter and early spring however, were a little less productive than the year before for a couple reasons. Our beloved lead worker had to take some time off for health reasons and things just have not been the same without her. She is doing well though and we are optimistic that she will be back soon. We also took it easy on the farm during the cool weather in anticipation of the arrival of another monumental change for us – the birth of our second son! 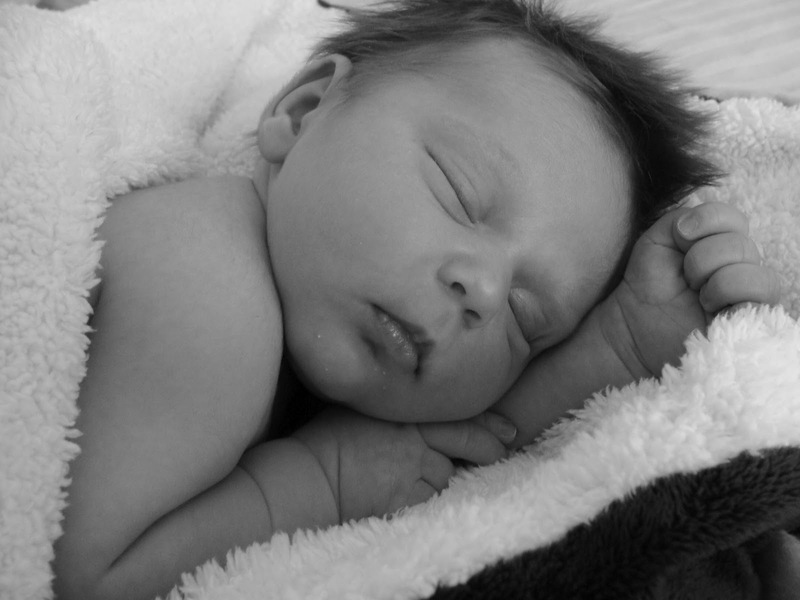 Creedance Wayne Kotila was born on May 25. The more mellow winter allowed us to focus on crop planning and management and as always, dreams for the future. In February I attended the well-known Eco-Farm conference for the first, but definitely not the last time. Three days of seminars on topics ranging from “food deserts” to small farm financial management left me inspired and reconnected to my passion. This farm is so much more than just a business to us. It is our home, our contribution to our community, our gateway to self-sufficiency and the legacy we hope to leave our sons. Thank you so much for allowing us to share it with you and your family! 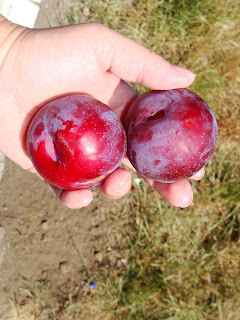 For a few precious weeks in July we get to enjoy these amazing little stone fruits. They are sweet and tangy, and so juicy you have to stand over the sink to eat them! I dream of them all year! Santa Rosa plum trees are found in peoples backyards all over the county, especially in older homes. They were developed by Luther Burbank in Santa Rosa in the late 1800s and are still one of the most popular varieties. Last week we used some imperfect fruit to make freezer jam. It is actually really easy and pretty quick to make. If you love them like I do and are interested in making some jam in order to enjoy the flavor in the middle of winter we are happy to sell you “jam fruit” at a great price. 7 – 1 cup containers with lids • 4 cups finely chopped plums • 2 tb fresh lemon juice • 3 cups sugar • 1 cup water • 1 box “Sure Jell” pectin. 1. Wash and rinse containers and lids. 1-2 cup plastic containers with tight fitting lids or pint jars work well. 2. 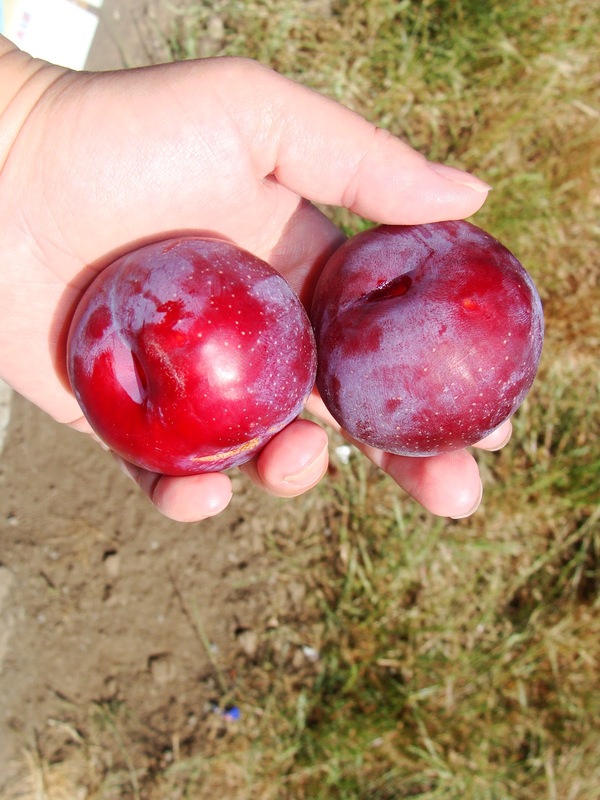 Wash plums, remove pit (an apple corer worked great!) DO NOT PEEL! Chop finely or pulse in food processor to desired texture. It should not be completely pureed but have nice bits of fruit in it. 3. Measure EXACT amount of fruit into bowl and mix in lemon juice. 5. Stir in 1 cup water, bring to a boil on medium high heat STIRRING CONSTANTLY. Boil and stir 1 minute, remove from heat. 6. QUICKLY stir fruit into hot pectin/sugar mixture, stir 1 minute. 7. Pour into prepared containers, leaving ½ inch headspace. Cover. 8. Let stand at room temp 24 hours, until set. Refrigerate up to 3 weeks, freeze up to 1 year. Easy and filling! Kids love them! Serve with pesto aioli or lemon garlic aioli. Mix all ingredients together. Batter will be thick! Heat 1” vegetable oil in a large deep skillet over medium heat. Drop small spoonfuls into hot oil and flatten slightly with spatula. Cook until golden brown and centers appear dry, then turn. Cook on the other side until golden brown, drain on paper towels. TO MAKE AIOLI: Mix mayonnaise with pesto or fresh lemon juice and minced garlic until you get the flavor you like. Add any other chopped herbs or seasoning you want! more info at Local Harvest! Five generations of the Casalegno Family have lived on this beautiful site in the hills of Soquel, and the Casalegno Family Farm has been family owned and in operation since 1916. Many of the trees in our Orchard are up to 80 years old, and feature several heirloom apple varieties such as "White Winter Pearmain" "Northern Spy" and "Hauer Pippin". Our 1/2 acre vegetable field is constantly expanding and diversifying as our farm continues to grow. Our most important goals are to connect with our community, and to maintain the integrity of this land for future generations. We are dedicated to preserving the heirloom varieties that have been on the farm for close to 100 years and to continuing to grow sustainable, organic produce for the Santa Cruz community.